A washboard stomach may look highly impressive but, in reality, it is damn difficult to achieve! Even after following a healthy diet and a rigorous exercise routine, you may not be able to remove that thin layer of fat hiding your well-toned abdominal muscles. In such situations, ‘Abdominal Etching’ can give you the lean and mean abs in a safe and predictable way. From tough ‘ripped muscle’ to highly-coveted ‘six-pack abs’, this cosmetic surgery has been known to produce magical looks without the need of strict dieting and hard workout. But what is the surgery all about? How does abdominal etching work? Is it worth a try? We know you have lots of question regarding the procedure. Let’s talk about it here. ‘Abdominal Etching’ has many other names, such as ‘Lipoetching’, ‘High-Def Liposuction’, and ‘Six-Pack Liposculpture’. It is a non-invasive ‘Liposculpture’ in which ‘Liposuction’ is performed first, which is then followed by ‘Sculpting’. The procedure focuses on the fat that are overlying the abdominal muscles and gives a chiseled look by removing it from certain areas while leaving as it is in rest of the parts. Basically, it carves different shapes in the fat, accentuates the underlying muscles, and defines the abs right away. Though abdominal etching started with women, it is equally popular in both men and women these days. Typically, the procedure works similarly for both genders, however, the approaches can be different based on individual goals. How Is Abdominal Etching Different? Traditional liposuction simply eliminates the ‘pockets of fat’ from the abdomen without putting much emphasis on its appearance while etching takes it to the next level by eradicating excess fat between the muscles and giving the stomach a tight-n-toned look. Abdominoplasty or tummy tuck helps people get rid of excess fat along with the extra skin in order to make the tummy tighter. But etching gives ‘fine-tuned sculpting effects’ by working on the precise lines of fat on the surface of the muscles to expose the natural muscle tone. How Is Abdominal Etching Done? It starts with a consultation that helps you know whether you are an ideal candidate or not and what pre-operative care instructions you need to follow. The surgeon locates the areas on your abdomen where incisions need to be made and outlines them to create detailed markings for the procedure. Antibiotics and ‘twilight anesthesia’ are given to ensure that you remain awake during the surgery but cannot stay fully aware or feel pain. Several small incisions (each of 1-2 mm.) are made along the traced lines in the inconspicuous parts of the abdomen, such as near the belly button or the natural creases of the pelvis. A very small metal ‘cannula’ (a flexible tube-like tool with blunt tips) is inserted under the skin through the incisions and a suction device is attached to its other end. The cannula is moved along the outlined areas vigorously in order to loosen the excess fat off the abdominal muscles, which is then sucked out to gradually. Typically, the process of abdominal etching takes an hour or so to be finished. However, in some cases, the duration can also range from 1.5 hours to 4 hours. As the process of etching creates grooves on the fatty layer of the abdomen, you cannot expect full results until the void is filled in with the retracting skin. So, it will take anywhere between 3 and 6 months to see the final results of the surgery and you must keep realistic expectations about it. Remember that abdominal etching is a one-time process with permanent outcomes. So, it is important that you find a reputed surgeon to make the surgery perfect the very first time. 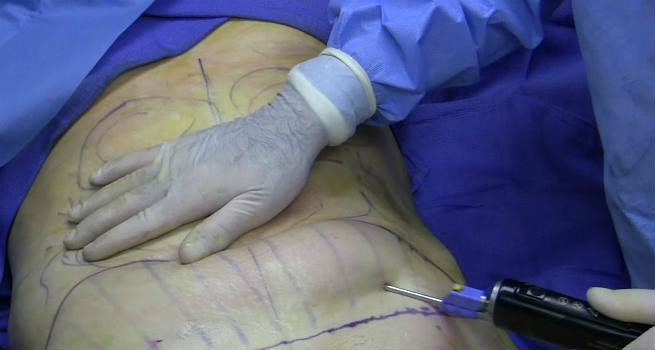 The process of abdominal etching recovery is painless and it takes only 2 to 3 weeks. You will be advised to wear a compression garment for a couple of weeks in order to speed up the healing of your stomach. Do not shower for at least 48 hours after the surgery. Resuming normal activities is allowed in a day or two while light exercise and swimming can be resumed in 5 days. Make sure that you do not engage in any strenuous activity including heavy workout and weight lifting for at least one month. It is crucial to follow a healthy diet as well as a robust workout routine during the recovery period. Also, follow the aftercare instructions religiously in order to avoid complications. It is a low-risk surgery that comes with a few mild side effects including swelling, bruising, pain or discomfort, etc., which typically go away in a couple of weeks. Including the fess of the surgeon, anesthesia, and the surgical facility, abdominal etching can cost you anywhere between $3,000 to $10,000. So if you want those washboard abs that you have been dreaming of and can shell out that much money, then it is surely a surgery to consider.